Remember when Mark Wahlberg and David O. Russell used to be a package deal? 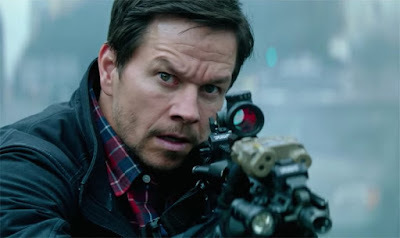 That ship has long since sailed and now Wahlberg is best bros with Peter Berg. Together they have made Lone Survivor, Deepwater Horizon, and Patriots Day together, all solid-to-great films in their own way. And now they've teamed up a fourth time on the action flick, Mile 22, which looks like a blast. "Do you want to live in a world where everybody feels cozy, validated all the time? Or do you want to live in a world that works?" Yeah, Wahlberg is one of those guys. He plays an off-the-books agent for a top secret organization known as Overwatch, tasked with keeping a live an informant whose identity has been exposed. The buzz around this film has been pretty high because of its supporting cast which includes future WWE champion Ronda Rousey, soon-to-be ex star of The Walking Dead Lauren Cohan, and the best screen fighter in the business, Iko Uwais of The Raid movies. John Malkovich also has a role, but it looks like most of the fun belongs to Uwais which is how it should be. Here's the synopsis: In this heart-racing action thriller, a CIA agent stationed in Indonesia is tasked with transporting an informant whose identity has been discovered, from the center of the city to an awaiting getaway plane at an airport 22 miles away. While en route, they must battle corrupt police, criminal overlords and heavily-armed locals, all hell-bent on taking them out before they reach their plane. Mile 22 opens July 20th.